I recently found out that even though I have been absent from my blog and just came back yesterday, that I have had an influx in readers. Yay! I am so happy to have you all here. So for you new readers that don’t know, every month I feature a cookbook of the month and write a little review and share a few recipes from said chosen cookbook. I am not paid or asked to do this. I have this little feature because I have a little bit of a cookbook hoarding collecting problem and since I have way more cookbooks, which contain way more recipes than I could possibly make in my life time, I thought this would be a good way to actually ‘use’ my cookbooks and at least make a few things from each book (before it gathers perma dust on the bookshelf). At times I have thought of stopping this feature because I don’t want to infringe on copy write issues, but I figure that since each recipe I find in my trusty cookbooks I take as inspiration and transform them into my own unique version, all is well (right? also other blogs share recipes from cookbooks too so I am not the only one). And, since I have a huge slight obsession with the Food Network and all of their famous chefs and own a lot of their cookbooks, a lot of theses recipes can be found on the Food Network website. Like this month’s cookbook author (or Eric’s ‘other girlfriend’ lol): Giada De Laurentiis. 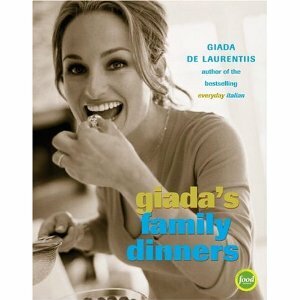 This month I am featuring the cookbook “Giada’s Family Dinner“. I was excited to feature this cookbook because I wanted to really hone my Italian cooking skills (one of the main reasons I think Eric likes Giada so much is because of his own Italian roots and love of their food). There are so many great Italian recipes in this book. From soups and salads to sandwiches and main entrees and my favorite dessert. There are a fare amount of of photos and each recipe has the number of servings listed but not the total cook and prep time. : ( Even though this is a regional cookbook and there are specific well known Italian ingredients needed for these recipes, most are pantry staples or can be found at your local grocery store. I also like that at the end of the book there are ‘sample menus’ using recipes in the book for different holidays and special events. And there is a much needed accessory for every cookbook a conversion chart and ingredient substitution page. So follow me this week as we go Italian! First recipe up is Herbed Cheese Polenta. I love polenta. 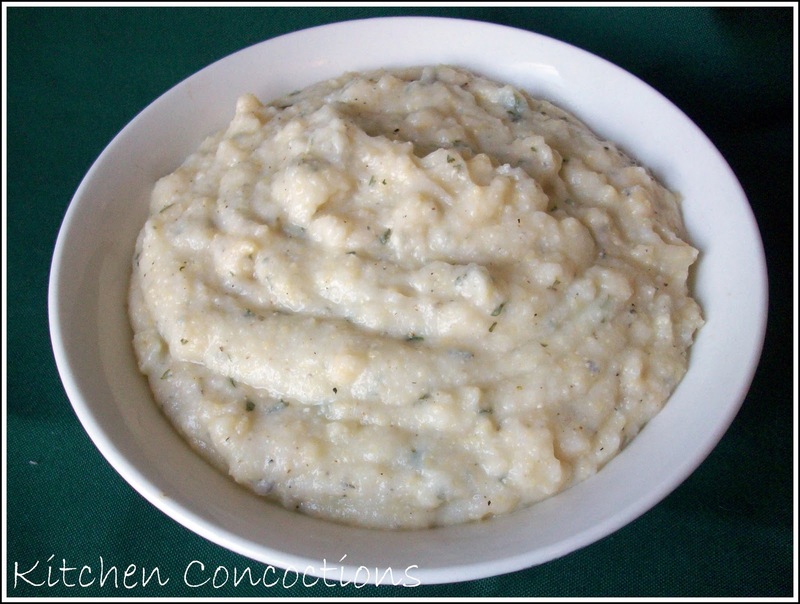 It reminds me of a Southern favorite: grits. It is so versatile. Add some cinnamon sugar to have a sweet breakfast polenta. Add salt, pepper and cheese to have a savory side with dinner. This version kicks it up a notch and with a variety of herbs that add a lot of flavor. Notes: I adjusted this recipe to use ingredients I had on hand. Instead of fresh herbs I used dried. Instead of regular milk I used buttermilk. Another tip of advice: when you are adding your cornmeal to the boiling water make sure and gradually whisk it in and do not just dump the cornmeal in all at once. If you just dump it in, the cornmeal will clump up and it will be hard to get it thoroughly mixed in. As always my changes are reflected below. Bring the water to a boil in a heavy large saucepan. Add 2 teaspoons of salt. Gradually whisk in the cornmeal. Reduce the heat to low and cook until the mixture thickens and the cornmeal is tender, stirring often, about 12-15 minutes. Add the cheese, milk, butter, parsley, rosemary, thyme, and pepper, and stir until the butter and cheese melt. Remove from heat and transfer the polenta to a bowl and serve.